Peach pie with a lattice crust is my all-time favorite pie. I know, I know, I just blogged about peaches last Friday. Can't help myself--these peaches are that good! I may be blogging about them next Friday as well. As I mentioned last time, I found these peaches at a chain supermarket of all places. I actually smelled them before I saw them! They are organic and grown as close to home as peaches can be grown. I had to walk past all the conventionally grown produce to get to the organic section. Though I would never buy a peach that wasn't organic, I picked them up and smelled them anyway. Nothing! I could have been holding a fuzzy ball of styrofoam, for all my nose knew! And people buy those things! Anyway ... got my fragrant little beauties home and decided to wait a day or two to make the pie just so I would have more time to enjoy looking at--and smelling--them. I believe they are called "Elegant Lady," a yellow-fleshed freestone named for its elegant balance of sugar and acid. They have a deep red flush (or, some might say, a crimson blush) on the thin, not-too-fuzzy skin with just a bit of yellow showing. And these fabulous family farmers must be very good at timing the picking. You can tell a peach that has been picked too soon by its "green shoulders" around the stem end. Not a single peach in the entire display had green shoulders. I don't want to give these up! I contacted the distributor to see how long they'll be available. The nice man, Homegrown Organic Farms director of marketing Scott Mabs, told me they would probably be finishing up by mid-August. About the pie: gorgeous, isn't it? You've got to make one! And tell me all about it. Eating vicariously is better for my waistline. C'mon, talk to me about pies! 1 Preheat oven to 425 degrees. On lightly floured surface, roll out dough to a 13-inch circle about 1/8 inch thick. Line 9-inch glass pie plate with pastry, trimming overhang to about 3/4 inch. Place in refrigerator. 2 On a piece of parchment, roll out second disk of dough just like the first. With a straight edge and a knife or pizza cutter, cut the dough into 10 even strips about 3/4 inch wide. Transfer, on the parchment, to a rimless baking sheet, cover with plastic or parchment, and refrigerate while preparing filling. All-butter pastry is fussy about being kept cold! 3 Peel peaches (or not, if they're thin-skinned and smooth like these) and slice into a large bowl (I use a 2-quart glass measure). You'll have about 6 cups of sliced peaches. (I slice them like this: Quarter peach, cut each quarter into 4 wedges, cut wedges in half.) In a small bowl, whisk together sugar, cornstarch, tapioca flour (vastly superior to cornstarch or any other thickener for fruit pies), salt and spices; add to peaches and mix gently but well. Pour into pie shell. 4 Working from the center, lay 5 strips of dough across the pie in one direction. Fold back every other strip halfway. Place a long strip of dough in the center going the other way. Unfold the folded strips over the crossing strip. Repeat with remaining 4 strips. Trim the overhanging strips even with the bottom crust and crimp the edge. 5 Place a foil-lined rimmed baking sheet in the middle of the oven to catch any drips, and place the pie on the baking sheet. Bake at 425 degrees for 30 minutes. Lower temperature to 350, and bake for an additional 35 minutes (juices should be bubbling). Cool on wire rack for at least 2 hours before serving. Thanks, Jenn! And do try this. Like you, my husband is not a peach pie fan; but he loves MY peach pie. 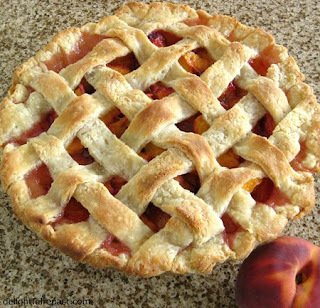 Really, if you've only ever had a frozen peach pie or a commercial peach pie (even a chain restaurant peach pie), you have not had a REAL peach pie. I think you'd be very surprised. That sounds amazing... I wish I had time to try it out! Maybe next summer, eh, when the little one is at a less demanding stage of life. Thanks, Thekla! Hey Jean, I just saw this on F.G., as your photo was published right next to mine. Your lattice is so beautiful-perfect even. I need to attempt this soon! Thank you, Stella! I love doing lattice crusts. People think it's something really tricky, but it's really so easy. Beautiful looking pie! I love peach pie...it is the perfect summer dessert. I have a bunch of peaches I just bought at the grocery store, I think I know what I am going to make! Yummy! Thanks, Christina! There's nothing quite like homemade peach pie. That is a work of heart..I love peach pie. Someone needs to make one for me.....I truly think it would make me well. Thanks, Charlotte. I love that - "work of heart." I wish I were there to make one for you! Get well soon. Looks amazing. My great grandmother used to make pies like this... I think it was apricot though. She doesn't bake anymore. I miss her pies! Thanks, Vered. Did you check out my earlier post on apricot hand pies? Maybe you could make those for your great grandmother! Looks absolutely delicious!! I would LOVE a piece (or perhaps two...), topped with some gorgeous Devonshire Clotted Cream, washed down with a lovely cup of tea... Now, which blend should I choose??!!! Thanks, Gavin. Wish I had a lovely cup of Devonshire Tea just now. Am on my way out to pick up a load of organic peaches. It's going to be a busy day! This looks gorgeous. I would love to have a slice with a cold glass of milk. YUMM! The glass of milk turns it into a high-protein breakfast, if you ask me, Joudie! Which would certainly start my day in a good mood. Thank you! I'm so glad he liked it! Well all I can say is oh my gosh!!! Such an excellent pie. I just finished dessert and my entire dinner party guest list is in a peach pie coma! I blind baked the bottom crust at 250 for 20 minutes first. I always think this is a good step with juicy fresh fruit pies as I don't like a soggy pie. Second, I brushed the top lattice crust with some milk and sprinkled it with sugar in the raw for that extra bit of texture and color. This pie rocks....it's so easy and delicious. Thanks Jean! You just made my day, Sterling! It makes me so happy to have people enjoying my recipes! I think brushing the top crust with milk and sprinkling it with a little sugar gives a very pretty look. I just rarely bother, for some reason. (Maybe I'm getting lazy these days!) Again, thank you!